Whenever I make lamb burgers on the grill at a barbecue, my guests are surprised that lamb can be made into a burger. 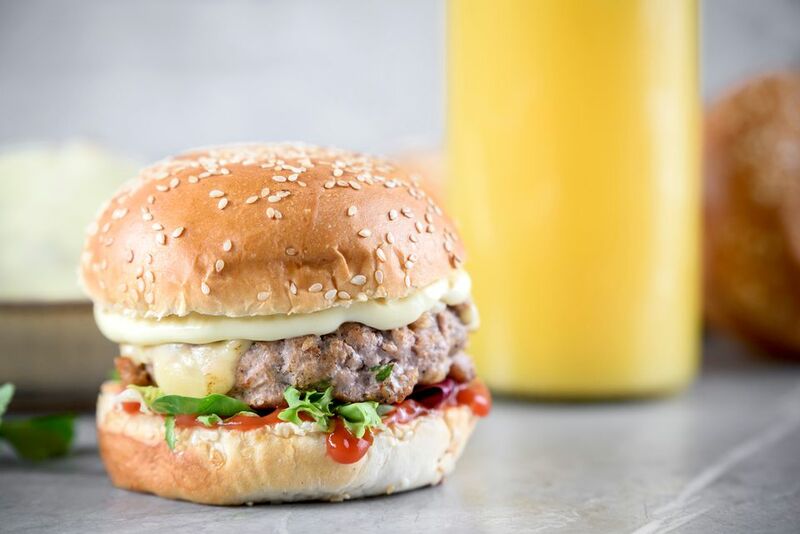 Contrary to popular belief, ground lamb makes for an excellent burger and does contain enough fat to keep it together and also have a good flavor. Most people who don't eat lamb very often don't think of lamb as burger meat, but it's true! Lamb burgers are delicious! Lamb is a little more expensive than ground beef and not as easy to find. A lot of grocery store don't put out a large selection of ground lamb because it is not bought as frequently. If you can't find it in your meat department, ring the bell, and ask the butcher if they have any available. Chances are they have some frozen, if not fresh. Preheat pan or grill to 375 F.
Form meat and spice mixture into 4 patties -- 1/2 to 3/4 inches thick. Put in heated pan or grill and cook for about 4 to 5 minutes each side. The flavor of lamb is best at a medium-well, so cook until you see a faint pink color in the center. You can certainly cook longer, should you choose. Place desired cheese on top and allow it to melt for about 30 seconds to one minute. Splash the pan with some cool water to create steam and put a stainless steel mixing bowl over the pan for about 30 seconds. The result is a perfectly melted cheese that hugs the burger. When serving lamb burgers, it's fun to choose a more fancy bun than what can be found in the bread aisle at your grocery store. Think brioche, sourdough, and even rolled flatbread for lamb burgers. Of course, the national brands will do, but we happen to think that lamb burgers are a little more special than beef burgers.